life, such as teamwork, respect and sportsmanship. This T-ball, basketball, and soccer program gives children a fun and positive first step into athletics. Through games and activities, campers explore balance, hand/eye coordination, and skill development at their own pace. Participants should bring appropriate clothing, two snacks, a water bottle, running shoes and sunscreen. Shin guards are recommended. If weather does not permit camp will move indoors to the BV Gym. 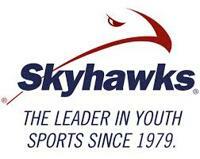 Skyhawks multi-sport camp is designed to introduce athletes to a variety of different sports in one setting. For this program we combine soccer, flag football and basketball into one fun-filled week. Athletes will learn the rules and essentials skills of each sport along with vital life lessons such as respect and teamwork. Participants should bring appropriate clothing, two snacks, a water bottle, running shoes, and sunscreen. If weather does not permit camp will move indoors to the Bayview Gym.